If it was odd back then for a local industry booster to cast doubt on that very cause, today the question is all but absurd. In its ninth year, the fair (Fashion Industry Gallery, 6-9 April) has expanded its roster, attracting big names such as Gagosian, Lehmann Maupin, Skarstedt and Shane Campbell Gallery, and important tastemakers like Karma—as well as its reach. 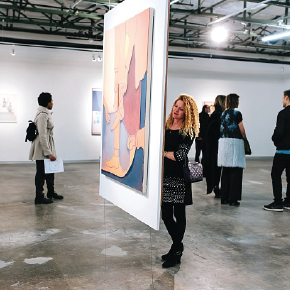 Dealers are fishing in less conventional ponds, such as San Francisco (which this year hosted its first iteration of the Miami-based Untitled) and Seattle, as they seek new buyers beyond the big fair cities. But Dallas has a head start, as the fair took root during the global recession that began in 2008. Since then, the Dallas-Fort Worth area has seen a population boom, while from 2010 to 2015, the Texas economy grew at nearly twice the rate as that of the rest of the US, adding dynamism to a city already famous for its dynastic energy-industry wealth. The collector Derek Wilson agrees, saying that he and his wife, Christen, who serve on several local and international museum boards, “have seen more collectors emerge, more galleries opening, and a vibrant artist scene. We have also seen a large influx of art-world interest in the form of visiting performances, artist visits and patron groups” from the Tate, the Centre Pompidou and others. Many of the local collectors employ advisers to buy in New York and Los Angeles, Wilson says, but “when looking at the regional artists and their regional galleries, the market is active and full”. The city benefits from a strong tradition of institutional support, centred on the Dallas Museum of Art, the anchor of the Dallas Art District. In 2005, Marguerite and Robert Hoffman, Deedie and Rusty Rose, and the Rachofskys all pledged their collections to the museum. That laid the foundation for a host of other cash and art gifts over the past decade—most recently, in January, 138 works by the likes of Yayoi Kusama, Eva Hesse and Jean Dubuffet from the estate of Dorace Fichtenbaum. But a newer class is getting in on the act and bringing a decidedly more contemporary buzz. Chief among the other private collections are the Goss-Michael Foundation and Alden Pinnell’s Power Station, which opened in 2011 and shows not only works from his own collection but also more experimental presentations. The current one, Steven Parrino (until 16 June), followed a show by Darren Bader—exhibitions that would be at home in New York or London. Jordan Ford, a collector and hotelier who returned to Dallas after some time on the coast, says he was pleased to put up Pierre Huyghe for his show at the Nasher Sculpture Center. “In the past four or five years, the types of galleries that I enjoy and frequent and have got to know and have a relationship with have started coming to Dallas,” he says.